The Camp clean-up went well this year, though we could have used a few more people. The dinner that Winchester Grange put on was a delicious and filling one. I thank all of their members who assisted in this endeavor. The Pink Sash Meeting also went well. The officers that were present and all the committees reported on what they did and on what they are planning for the future. Their articles in this issue should carry those reports. The majority of the Grange evaluations are being conducted as I write this so I cannot tell you much about them. I have received some comments on them and encourage members to tell me of their experiences. When they are all completed I will examine the statistics and give you a report. One note of encouragement, several Granges have said they are bringing in new members. 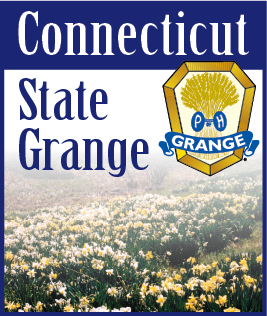 I hope this will be a banner year for the Connecticut State Grange. At the Pink Sash Meeting I explained a plan I have for evaluating and aiding Community Granges that are struggling. I am going to form two teams of dedicated Grangers. One in the western half of the state and one in the eastern half. On June 18 and 19 of this month, the National Grange Leadership/Membership Director, Rusty Hunt, will visit our state and will meet with these teams for the purpose of training them to recognize what Community Granges need the most assistance and how to assist them to grow and become more stable Granges once again. I think with this training and the support of the Community Granges we can move the Grange in Connecticut forward. I know there are Granges holding public events in their halls to attract new members and I hope they are successful. Please read the committee articles in this issue to see what events are happening. Two important ones are the Connecticut Grange Sunday at Good Will Grange Hall on the 8th. Service is at 11:00 A.M. followed by lunch, prepared by the State Youth Committee. Then the Talent Program and the Junior Talent Program will be presented. New England Grange Sunday will be held at Cathedral of the Pines in Rindge, New Hampshire on the 22nd at 3:00 P.M. Worthy State Chaplain Amy Whitcomb is responsible for the sermon this year, I hope many of you will be able to make the trip to support her. On this note, please attend the special events of other Granges whenever possible. Let’s support our neighboring Granges.